Ross Bay Cemetery - Historical Places of Victoria, B.C. The Ross Bay Cemetery is one of the most historical locations in all of Victoria, B.C. Since 1873, the 27-acres of land have been a designated burial site for the citizens of Victoria, and it contains many famous figures. Despite its morbid purpose, Ross Bay Cemetery is considered a beautiful place for a stroll. Breathtaking ocean views, intricate pillars and magnificent mausoleums laced with twists of carriage ways and towering trees are some of the charming features that entice walkers to pay the site a visit. For a more in-depth experience than just a wander through a beautiful park, join in on one of the Old Cemeteries Society of Victoria tours. You can dive into Black History and Victoria’s role as haven for people fleeing racism in California, explore the life of Emily Carr, discover the war graves, or experience any number of aspects of the Ross Bay Cemetery. There are nearly 30,000 graves in the cemetery, with a discovery of 270 unused plots in recent years, which have since been auctioned off. Needless to say, each grave holds its own piece of Victoria’s history, and you could spend an entire day exploring the somber beauty of the cemetery. Victoria, B.C. is considered to be a quite haunted city, with numerous famous landmarks having a reputation of being very active after dark. Of course, being a cemetery, Ross Bay Cemetery is often a hotspot for Ghost Tours, which are some of the most popular walking tours in Victoria. While access to the cemetery is forbidden after dusk, a ghost tour through the park will still raise the hairs on your arms. You’ll listen to some of Victoria’s most haunting ghost stories and discover pieces of the darker side of Victoria’s past. 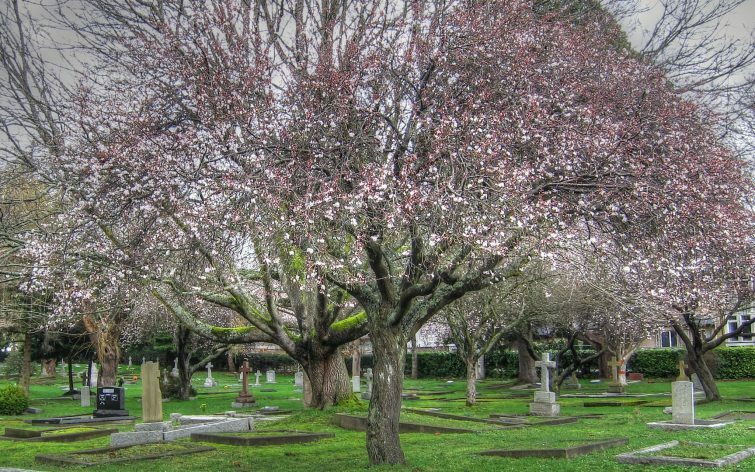 Whether you’re there for the beauty, the history, the ghosts, or maybe a little bit of all three, the Ross Bay Cemetery is a prominent piece of Victoria B.C., well worth the visit.